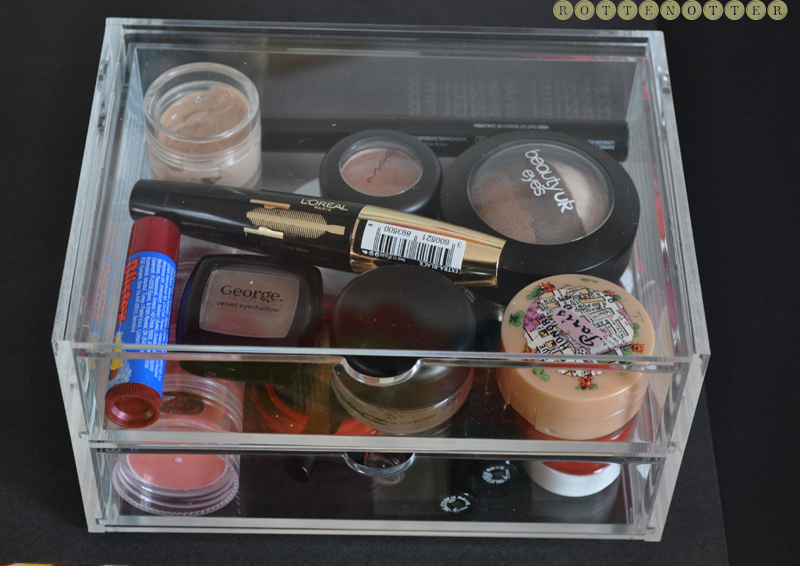 Having a bit of blogger's block at the moment so thought I'd show you how I store my lipsticks and everyday products. I've been on a spending ban since August (and is going well, haven't bought anything apart from necessary items) so can't really show you what I've been buying or any new products. If you have any blog post requests let me know! So I keep both my lipsticks in a compartment box and everyday products and other lip products in two drawers both from Muji. I actually bought both of these the last time I was in London. It was my first time going to an actual Muji shop rather than ordering online. I wouldn't recommend buying any of the plastic storage sets from the shop as they can be quite heavy. It's nice to see things in person though and the actuall sizes of them. Since having my lipsticks on show I've found myself using them more. I'd love to having all my make-up in clear drawers as I know I'd use everything more but I just can't afford it at the moment. For now I keep everything else in my two ikea drawer sets. 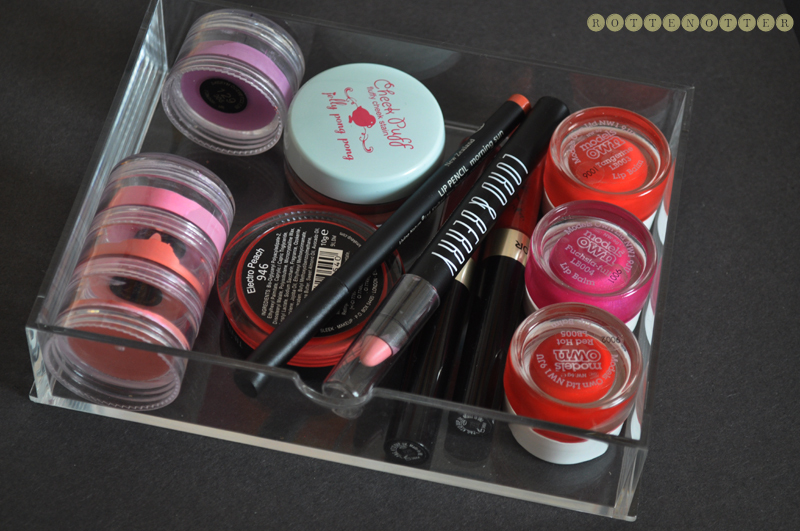 As you can see, each compartment can hold about 5 lipsticks so I've got plenty of room for new purchases. This sits on the two drawer set below and this sits on my two ikea drawers. If you want a more in depth post on my lipstick collection let me know! 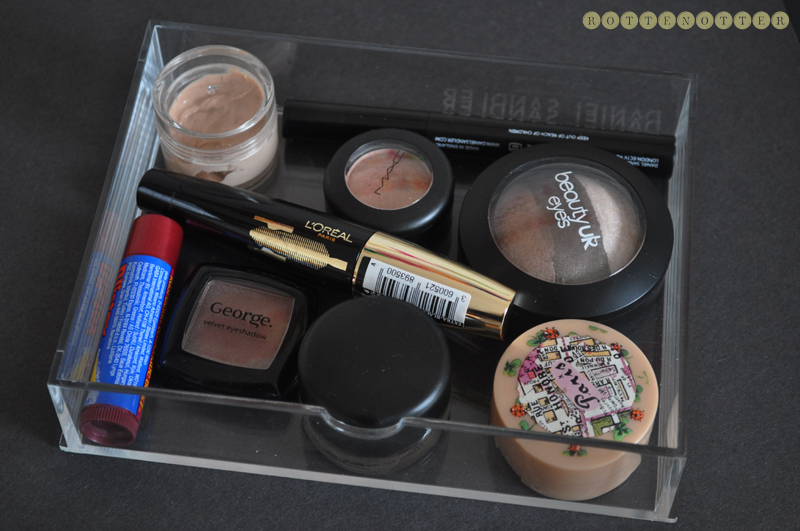 In the first drawer I keep my everyday products that I'm using at the moment. This way I can simply pull the drawer out and take it to wherever I want. I don't have to rummage through everything to find what I want. If I'm not wearing any face products, I'll always have eye make-up on and some sort of lip product. I mix this drawer up each week but it always consists of primer, eye shadow, mascara and lip balm. I've definitely been getting more use out of my eyeshadows this way as I'm not always sticking with the same products. At the moment I have a depotted Urban Decay eye primer, Daniel Sandler Baby Jet mascara, Mac All That Glitters eyeshadow, Beauty UK Earth eyeshadow trio, L'Oreal Volume Million Lashes mascara, Blistex Rasberry Lemonade lip balm, George Delusional eyesahdow, Mac Bare Study paint pot and Bourjois Beige Rose eyeshadow. In the bottom drawer I have more lipsticks, lip pencils and more pigmented/lipstick-like lip balms. As these don't really go or fit in with my other lipsticks they live here. I have depotted Barry M lipsticks, Jelly Pong Pong Cheek Puff (cream blushers/lip stain), Sleek Electro Peach tinted lip conditioner, Living Nature Morning Sun lip pencil,* Lord & Berry Vintage Pink lipstick, two Max Factor liquid lipsticks*, Models Own lip balms in Tangerine, Fuchsia Full and Red Hot. 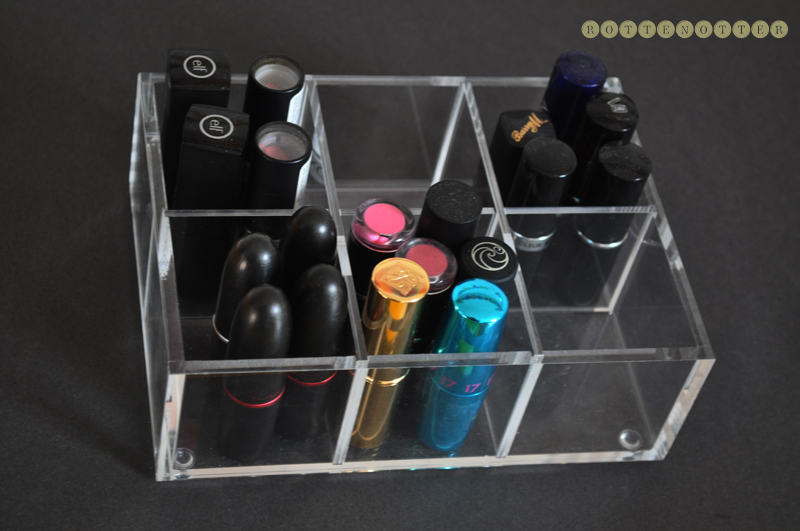 How do you store your lip products and everyday products? Love these little drawers, great storage! So organised! Everything in my case is thrown into an old box my phone came in or crammed into a drawer! I love muji! I found myself drooling when I first went in one of the shops. I'm going to Leeds soon and there's on there so I'm gonna have a look and I was planning on buying something but if it's heavy I might just order, depending on the delivery cost. I definitely want to have a look at the sizes and stuff first anyway.